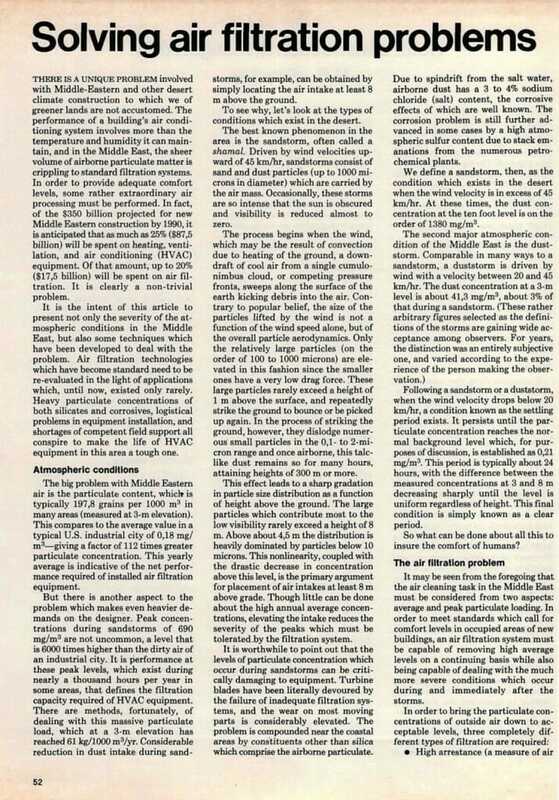 This article was a bit of a departure from my usual tech-freelancing beat of the early 1980s… instead of artificial intelligence or microprocessors, it was about air filtration problems in the Middle East. As with many such arcane topics, I became ever more intrigued as I researched the non-trivial problems and their technological solutions… this was a ghost-writing gig for American Air Filter. The piece highlights the special problems of desert regions along with some approaches to dealing with airborne grit that can be devastating. THERE IS A UNIQUE PROBLEM involved with Middle-Eastern and other desert climate construction to which we of greener lands are not accustomed. The performance of a building’s air conditioning system involves more than the temperature and humidity it can maintain, and in the Middle East, the sheer volume of airborne particulate matter is crippling to standard filtration systems. In order to provide adequate comfort levels, some rather extraordinary air processing must be performed. 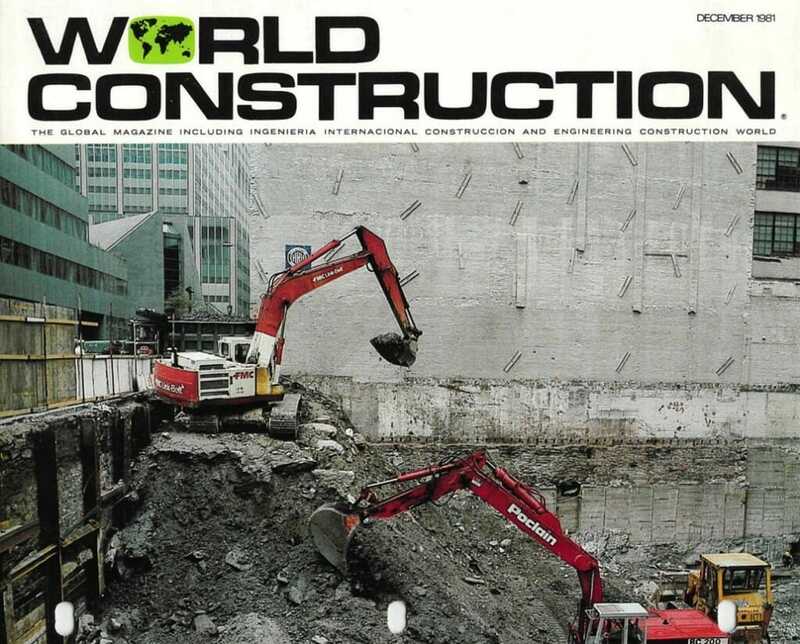 In fact, of the $350 billion projected for new Middle Eastern construction by 1990, it is anticipated that as much as 25% ($87.5 billion) will be spent on heating, ventilation, and air conditioning (HVAC) equipment. Of that amount, up to 20% ($17.5 billion) will be spent on air filtration. It is clearly a non-trivial problem. It is the intent of this article to present not only the severity of the atmospheric conditions in the Middle East, but also some techniques which have been developed tò deal with the problem. Air filtration technologies which have become standard need to be re-evaluated in the light of applications which, until now, existed only rarely. Heavy particulate concentrations of both silicates and corrosives, logistical problems in equipment installation, and shortages of competent field support all conspire to make the life of HVAC equipment in this area a tough one. 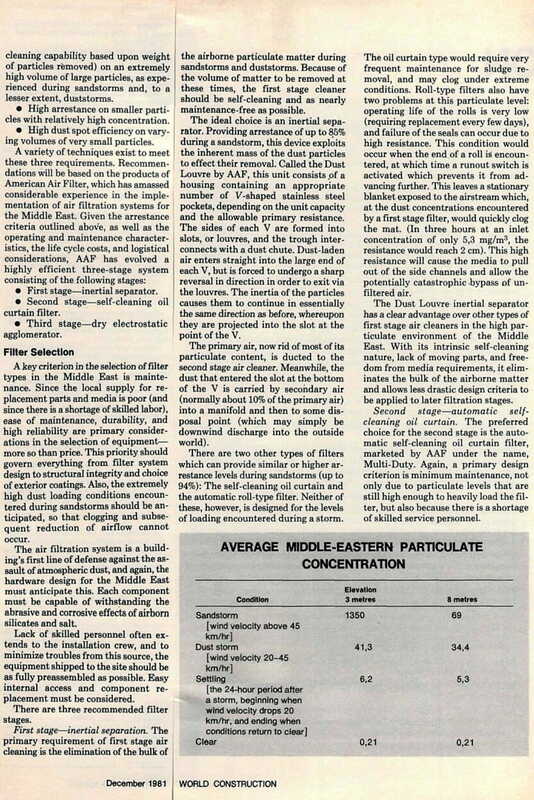 The big problem with Middle Eastern air is the particulate content, which is typically 197,8 grains per 1000 m³ in many areas (measured at 3-m elevation). This compares to the average value in a typical U.S. industrial city of 0,18 mg/m³—giving a factor of 112 times greater particulate concentration. This yearly average is indicative of the net performance required of installed air filtration equipment. But there is another aspect to the problem which makes even heavier demands on the designer. Peak concentrations during sandstorms of 690 mg/m³ are not uncommon, a level that is 6000 times higher than the dirty air of an industrial city. It is performance at these peak levels, which exist during nearly a thousand hours per year in some areas, that defines the filtration capacity required of HVAC equipment. There are methods, fortunately, of dealing with this massive particulate load, which at a 3-m elevation has reached 61 kg/1000 m³/yr. Considerable reduction in dust intake during sandstorms, for example, can be obtained by simply locating the air intake at least 8 m above the ground. To see why, let’s look at the types of conditions which exist in the desert. The best known phenomenon in the area is the sandstorm, often called a shamal. Driven by wind velocities upward of 45 km/hr, sandstorms consist of sand and dust particles (up to 1000 microns in diameter) which are carried by the air mass. Occasionally, these storms are so intense that the sun is obscured and visibility is reduced almost to zero. The process begins when the wind, which may be the result of convection due to heating of the ground, a downdraft of cool air from a single cumulonimbus cloud, or competing pressure fronts, sweeps along the surface of the earth kicking debris into the air. Contrary to popular belief, the size of the particles lifted by the wind is not a function of the wind speed alone, but of the overall particle aerodynamics. Only the relatively large particles (on the order of 100 to 1000 microns) are elevated in this fashion since the smaller ones have a very low drag force. These large particles rarely exceed a height of 1 m above the surface, and repeatedly strike the ground to bounce or be picked up again. In the process of striking the ground, however, they dislodge numerous small particles in the 0.1- to 2-micron range and once airborne, this talc-like dust remains so for many hours, attaining heights of 300m or more. This effect leads to a sharp gradation in particle size distribution as a function of height above the ground. The large particles which contribute most to the low visibility rarely exceed a height of 8 m. Above about 4,5 m the distribution is heavily dominated by particles below 10 microns. This nonlinearity, coupled with the drastic decrease in concentration above this level, is the primary argument for placement of air intakes at least 8m above grade. Though little can be done about the high annual average concentrations, elevating the intake reduces the severity of the peaks which must be tolerated by the filtration system. It is worthwhile to point out that the levels of particulate concentration which occur during sandstorms can be critically damaging to equipment. Turbine blades have been literally devoured by the failure of inadequate filtration systems, and the wear on most moving parts is considerably elevated. The problem is compounded near the coastal areas by constituents other than silica which comprise the airborne particulate. Due to spindrift from the salt water, airborne dust has a 3 to 4% sodium chloride (salt) content, the corrosive effects of which are well known. The corrosion problem is still further advanced in some cases by a high atmospheric sulfur content due to stack emanations from the numerous petrochemical plants. We define a sandstorm, then, as the condition which exists in the desert when the wind velocity is in excess of 45 km/hr. At these times, the dust concentration at the ten foot level is on the order of 1380 mg/m³. Following a sandstorm or a duststorm, when the wind velocity drops below 20 km/hr, a condition known as the settling period exists. It persists until the particulate concentration reaches the normal background level which, for purposes of discussion, is established as 0.21 mg/m³. This period is typically about 24 hours, with the difference between the measured concentrations at 3 and 8 m decreasing sharply until the level is uniform regardless of height. This final condition is simply known as a clear period. So what can be done about all this to insure the comfort of humans? It may be seen from the foregoing that the air cleaning task in the Middle East must be considered from two aspects: average and peak particulate loading. In order to meet standards which call for comfort levels in occupied areas of new buildings, an air filtration system must be capable of removing high average levels on a continuing basis while also being capable of dealing with the much more severe conditions which occur during and immediately after the storms. High arrestance (a measure of air cleaning capability based upon weight of particles removed) on an extremely high volume of large particles, as experienced during sandstorms and, to a lesser extent, duststorms. High arrestance on smaller particles with relatively high concentration. High dust spot efficiency on varying volumes of very small particles. Second stage—self-cleaning oil curtain filter. A key criterion in the selection of filter types in the Middle East is maintenance. Since the local supply for replacement parts and media is poor (and since there is a shortage of skilled labor), ease of maintenance, durability, and high reliability are primary considerations in the selection of equipment— more so than price. This priority should govern everything from filter system design to structural integrity and choice of exterior coatings. Also, the extremely high dust loading conditions encountered during sandstorms should be anticipated, so that clogging and subsequent reduction of airflow cannot occur. The air filtration system is a building’s first line of defense against the assault of atmospheric dust, and again, the hardware design for the Middle East must anticipate this. Each component must be capable of withstanding the abrasive and corrosive effects of airborn silicates and salt. Lack of skilled personnel often extends to the installation crew, and to minimize troubles from this source, the equipment shipped to the site should be as fully preassembled as possible. Easy internal access and component replacement must be considered. There are three recommended filter stages. First stage—inertial separation. The primary requirement of first stage air cleaning is the elimination of the bulk of the airborne particulate matter during sandstorms and duststorms. Because of the volume of matter to be removed at these times, the first stage cleaner should be self-cleaning and as nearly maintenance-free as possible. the same direction as before, whereupon they are projected into the slot at the point of the V.
The primary air, now rid of most of its particulate content, is ducted to the second stage air cleaner. Meanwhile, the dust that entered the slot at the bottom of the V is carried by secondary air (normally about 10% of the primary air) into a manifold and then to some disposal point (which may simply be downwind discharge into the outside world). There are two other types of filters which can provide similar or higher arrestance levels during sandstorms (up to 94%): The self-cleaning oil curtain and the automatic roll-type filter. Neither of these, however, is designed for the levels of loading encountered during a storm. The oil curtain type would require very frequent maintenance for sludge removal, and may clog under extreme conditions. Roll-type filters also have two problems at this particulate level: operating life of the rolls is very low (requiring replacement every few days), and failure of the seals can occur due to high resistance. This condition would occur when the end of a roll is encountered, at which time a runout switch is activated which prevents it from advancing further. This leaves a stationary blanket exposed to the airstream which, at the dust concentrations encountered by a first stage filter, would quickly clog the mat. (In three hours at an inlet concentration of only 5,3 mg/m³, the resistance would reach 2 cm). This high resistance will cause the media to pull out of the side channels and allow the potentially catastrophic bypass of unfiltered air. The Dust Louvre inertial separator has a clear advantage over other types of first stage air cleaners in the high particulate environment of the Middle East. With its intrinsic self-cleaning nature, lack of moving parts, and freedom from media requirements, it eliminates the bulk of the airborne matter and allows less drastic design criteria to be applied to later filtration stages. Second stage—automatic self-cleaning oil curtain. The preferred choice for the second stage is the automatic self-cleaning oil curtain filter, marketed by AAF under the name, Multi-Duty. Again, a primary design criterion is minimum maintenance, not only due to particulate levels that are still high enough to heavily load the filter, but also because there is a shortage of skilled service personnel. Consisting of overlapping filter panels carried on a pair of continuous chains, this filter operates without the need for media changing and thus is never out of service during a storm. Dirt which is trapped by the oil-wetted panels is removed during each complete revolution through the bath, and ultimately collects as a sludge in the oil reservoir at the bottom of the unit. This sludge must be removed every 90 days, or immediately after each sandstorm or duststorm if the build-up is large. This function can be performed by unskilled personnel. The curtain rotation is not constant. At 12-minute intervals, a synchronous timer actuates the drive motor and drives it sufficiently for the curtain to make approximately one complete revolution every 24 hours. This intermittent operation improves the self-cleaning operation and assures better drainage of the panels as they leave the oil bath. It is possible to use disposable media roll-type filters as second stage air cleaners, but it is not recommended. The particulate loading is too high in most locations in the Middle East—even with an inertial separator arrestance of 90%, an inlet concentration of 69 mg/m³ would result in a 6.9-mg/m³ input to the second stage. Roll-type filters are simply not designed for these levels of dust concentration, being meant for levels of 0.5 mg/m³ and below. In order to provide reliable operation as a second-stage cleaner, maintenance crews would have to be kept on emergency standby during storms. Thus, from both logistical and performance standpoints, the automatic oil-curtain filter is a preferred choice for second stage filtration in the Middle East. Third stage—dry electrostatic agglomerator. The choice of filter for the third stage is largely a function of the required level of clean air in the area served by the system. The Roll-o-Matic roll-type replaceable media filter is adequate for most non-critical areas. Basically, this type of filter consists of a 20-m roll of interlaced glass filament media impregnated with Viscosine adhesive. The dust build-up on the media is monitored by a photoelectric control system, which winds the roll forward to expose a new blanket to the airflow whenever media light transmission reaches a certain preset level. A higher quality choice is the extended surface filter, which has an ASHREA dust spot efficiency on the order of 90 to 95%. But the best choice is a combination of the extended surface technique with an electrostatic agglomerator, marketed by AAF under the name Electro-Pak. The unaugmented extended surface filter relies entirely on the arrestance of the cartridge media to remove airborne particulates remaining from the first two stages of filtration. The interstices of the filters gradually fill up, eventually requiring media replacement as resistance to the air flow becomes high. But the addition of an electrostatic agglomerator on the input side of the standard filter provides numerous advantages. Even the smallest particles are trapped by the agglomerator plates, as they are given a strong positive charge by the ionizer section of the unit. The grounded plates then attract these particles, which stick to the surface and gradually build up in small clumps, or agglomerates. Since the forces which bind these agglomerates are stronger than the forces holding them to the plates, they are eventually swept off by the airstream and collected in the filter media. It would seem at first glance that the filters would become clogged just as quickly as they would without the agglomerator stage, but it is not so. Since the material is collected in the form of relatively large chunks and flakes, it is held loosely by the filter bags. Without the benefit of the electrostatic precipitation, this same material would have uniformly filled the fabric of the filter media. The net effect is a roughly five-fold extension of media life. An additional advantage of this structure is fail-safe particulates remaining operation in the event of a power failure in the agglomerator section. If this occurs, the extended surface filters simply function in their normal passive mode. Based on the same fundamental design philosophy, AAF’s Rollotron, combines the agglomerator stage with a roll-type filler. This provides electrostatic filter efficiency without the more demanding maintenance requirements of washer-type electrostatic filters. It is recommended that detailed data sheets be consulted to resolve the relatively subtle tradeoffs in the choices at this level. In highly critical occupied areas, such as hospital operating rooms and intensive or coronary care units, it may be desirable to append a fourth stage of filtration at the entry point to the room. This ultra-clean air can be assured by the use of high efficiency particulate air (HEPA) filters, such as AAF’s Astrocel III.